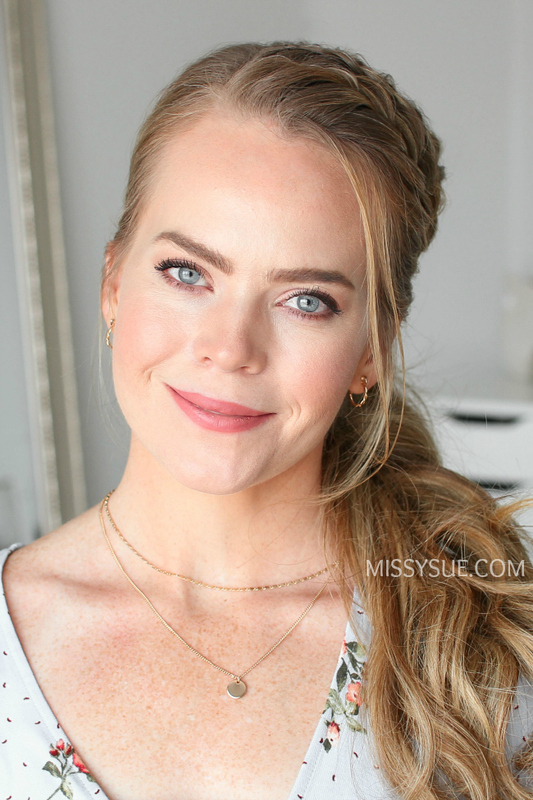 Another ponytail tutorial! 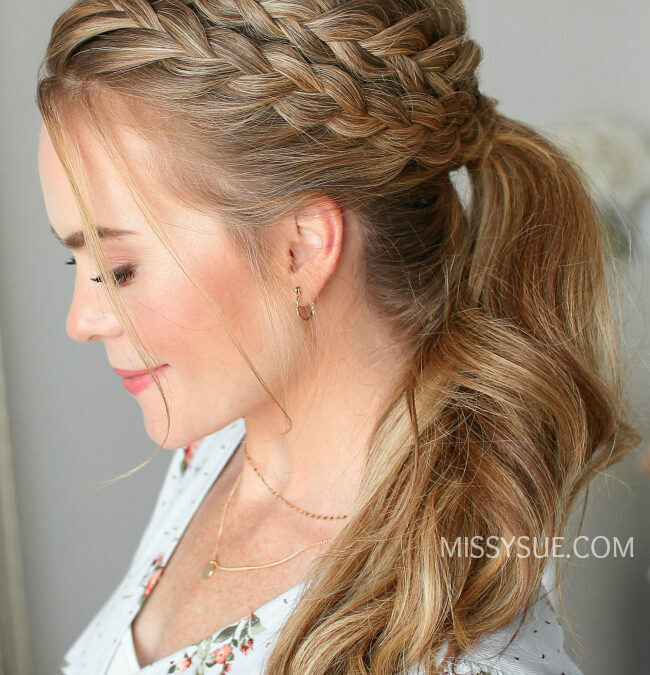 I saw a picture of this style and loved how it looked like the first braid almost wrapped around the entire head twice to create the second braid. Luckily, this tutorial is much easier than that. Step 2 /On the heavy side of the part, divide out a 3″ section a hair at the hairline and clip away the back hair. 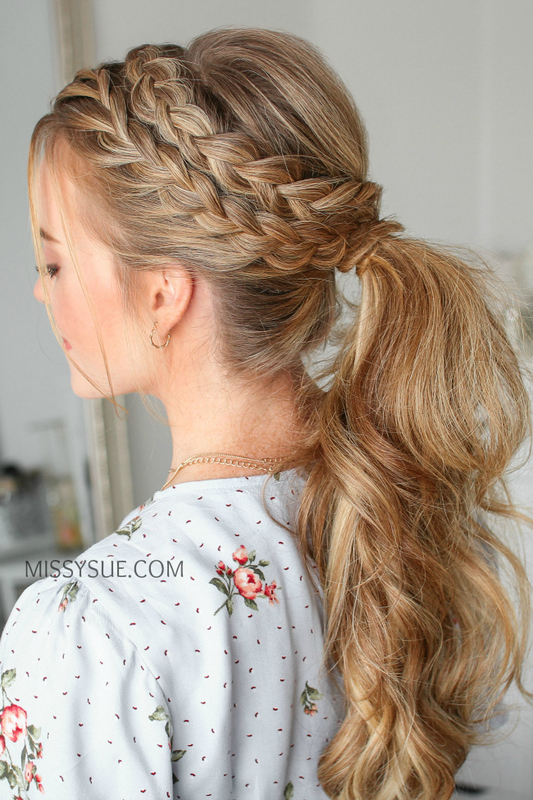 Step 3 / Pick up a small section near the part and divide it into three pieces for the braid. Step 4 / Begin a lace braid by crossing the right strand over the middle and then cross the left strand over the middle. Step 5 / Crossing the right strand over the middle and bring a new section into the braid. Step 6 / Then I’m crossing the left strand over the middle, picking up a new section and crossing it into the braid. Step 7 / Now stop adding in new section to the back side of the braid and only bring in hair to the front side of the braid and just continue the braid down to the left ear. Step 8 / Go back over the braid, pulling on the edges to make it fuller. Step 9 / Then tie off the bottom of the braid with an elastic band. 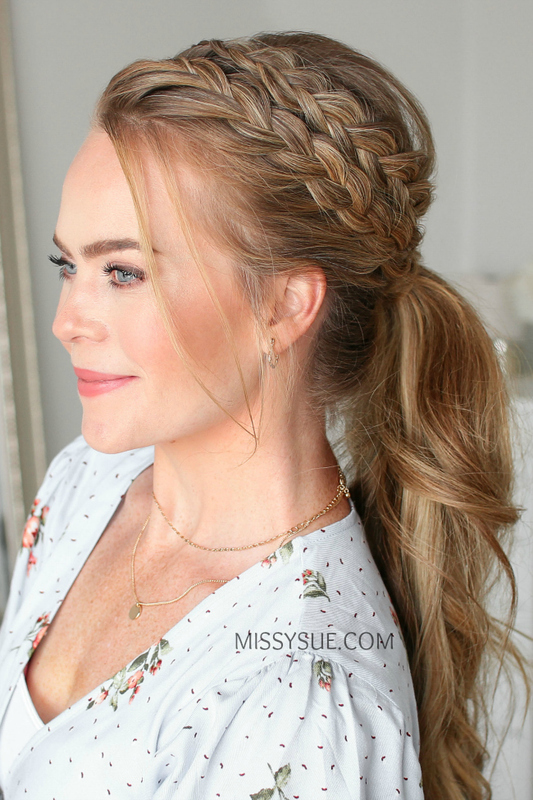 Step 10 / Divide out a new section of hair behind the first braid and begin a dutch braid, crossing the side strands under the middle while incorporating new sections into the braid. Step 11 / Once the braid reaches the left temple, braid the rest of the section to the bottom. Step 12 / Go back over the braid, pulling on the edges to make it fuller and then tie off the bottom with an elastic band. Step 13 / Combine the rest of the hair together and tie it off with a hair band. 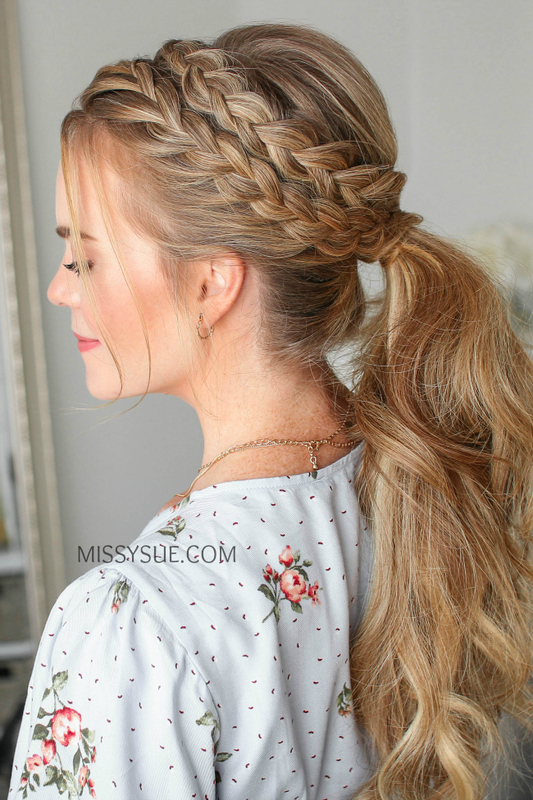 Step 14 / Wrap the dutch braid over the ponytail and pin it underneath with a bobby pin. Step 15 / Now wrap the lace braid over the ponytail and pin it underneath a bobby pin. Step 16 / Set everything in place with hairspray.